Today's healthcare IT environment is complex and highly regulated. Demands of patient care and government compliance require a mix of technologies -- clinical applications, computing, data, video communications and storage, security, wireless networking and mobile solutions – to work efficiently together and deliver reliable high-performance distributed services with a minimum of errors. ATSG has the skills and experience to meet the IT needs of organizations in the Healthcare industry. 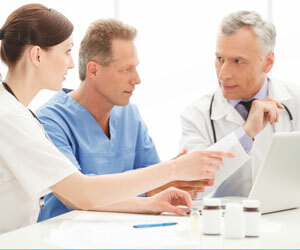 We are the trusted advisors to many hospitals and healthcare providers. ATSG designed and implemented a Cisco Unified Communications system and storage system upgrade for a large regional healthcare provider, including an Auto-Appointment Confirmation System. ATSG relocated and upgraded the entire data center of a large healthcare organization, including virtualization and server consolidation -- while improving network speed and reliability, and reducing equipment footprint. ATSG upgraded the security	and IT infrastructure at a leading hospital and research facility as part of the deployment of a new Electronic Medical Records (EMR) Platform – including an Auto-Prescription Refill system. ATSG upgraded and moved the entire server infrastructure of a medical center and installed an Allscript EMR system. Legacy networking was upgraded with virtualization and a phone system was upgraded with a Cisco collaboration communication suite. A secure storage system was implemented to comply with federal regulations.